I feel like I have been waiting for this book to be released forever. Thankfully within minutes of delving into it, I can safely say it was worth the wait. I absolutely loved everything to do with this book and it is clear the author must love perfume, with the way it was described , the scents, and what sensations they can evoke in a person. It is also the story of how you need to be brave to follow your dreams even if it means spending time apart from your twin sister. It is a story of regaining your confidence, of not stooping to your competitors levels of sabotage and instead being a decent human being, and it is a story of trusting your heart and instincts. Oh and its set in Paris, and features a perfume competition of which Del is just one of the competitor. Del is instantly likeable, seems to have lost some confidence in her perfume making abilities, since her gran died a few years back, but has entered this competition as it brings with it fantastic career opportunities. So long as she can make it past the earlier rounds and not be driven round the bend with here fellow competitors antics. Del is also just slightly clumsy, after all how else can you explain 3 accidents occurring throughout her first day in Paris that all just happen to have one other factor in common. I loved not only the descriptions of the perfumes and the scents, which I wished I had a defined enough sense of smell to be able to full appreciate, but the descriptions of Paris. 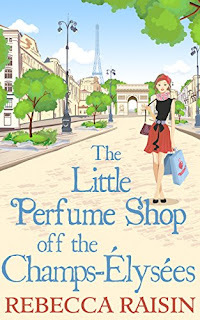 Both characters and locations from the other books in Rebecca Raisin's Little Paris Collection have a brief moment in the spotlight, although if you haven't read the other books it won't matter as this is a complete standalone, but with extra goodies for regular readers of the author. There is also an excursion so Provence, to the home of Lavender and I could see it all so clearly, I thoroughly enjoyed this section of the book too with all of its descriptions, and the accompanying story with it too. Humour, romance, Paris, french food (well some), a bouquet of scents to tickle your senses, rivalries and a lot of perfume, all combine to bring you one fabulous book. I just hope we don't have to wait as long for the next Rebecca Raisin book.